At Interiorscapes, we occasionally talk about something called Biophilia. You may know what this is or you may be wondering what this fancy five syllable word really means. Well I’ve got good news for you. 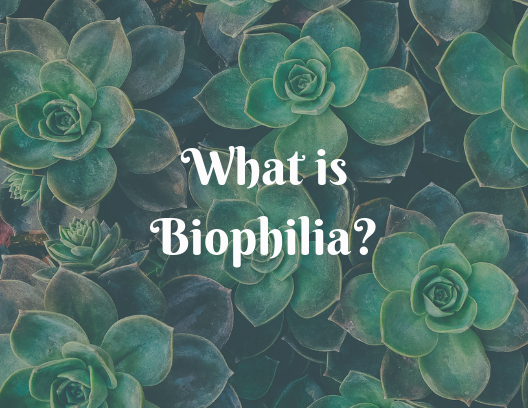 I am here to let you in on what Biophilia means and why it could be useful to you and your business. The definition of the word is simply: an innate love for the natural love. As the world gets more urban and less rural, our hearts still long for that connection to nature regardless of the fact that most of us are in an office five days a week rather than spending time outdoors. To combat this, there has been a movement to incorporate biophilic designs into buildings and workplaces. According to Kellert and Calabrese in The Practice of Biophilic Design (www.biophilic-design.com), there are three main categories. Light: while floor to ceiling glass windows may be ideal, it’s not always practical. If you have windows, be sure to keep them clean and keep the blinds open to allow sunlight to filter in. Water: These can be achieved through water features like fountains, ponds, etc. Both the view of the water and the muted sounds from water help people feel more connected to nature through water features. Plants: Kellert and Calabrese say “Vegetation… is one of the most successful strategies for bringing the direct experience of nature into the built environment. The presence of plants can reduce stress, contribute to physical health, improve comfort, and enhance performance and productivity.” This can be achieved with green walls that require little to no upkeep as well as plants in planters being placed strategically throughout an area. Natural Landscapes: Design strategies that include atriums, gardens and the like give people a place to “escape to nature” without having to go far. Image of Nature: This one can easily be done through photographs, paintings, sculpture and more. These items should be thematic and repeated throughout the area. Natural Materials: Incorporate design elements of wood, stone, cotton or leather. We have created driftwood succulent arrangements that fall into this category. Natural Colors: Avoid high intensity artificial colors and stick to muted earth tones with pops of bright colors. The bright colors should emphasis things like flowers, plants or sunsets. The last category is the experience of space and place. The subcategories are prospect and refuge, organized complexity, transitional spaces, integration of parts to wholes, and mobility and wayfinding. These principles tend to be important to incorporate at the beginning and harder to add in after the fact. Here are some examples of ways you may already see biophilic design in the spaces you frequent. Prospect and Refuge: The Vestavia Hills Library in the Forest is a great example of prospect and refuge. The library is surrounded by views of trees. It feels like walking through a forest when browsing the shelves there. Transitional Spaces: Anything that connects the indoors to the outdoors falls under this. Hallways, patios, porches, doorways, etc. Incorporating biophilic design is a great way to connect with nature. Look around and see how you are already incorporating it and how you could improve your space.